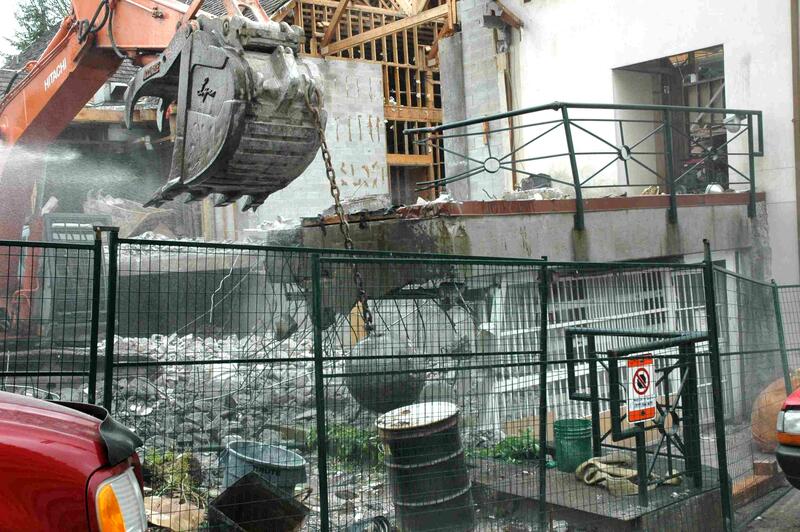 (Update Feb 2013) The demolition of St. John’s Church in June 2012 to make way for a 22-storey tower for Westbank/Peterson was one of the first major demolition projects in the West End in many years. In February 2013, excavation work has just begun. If City Hall has its way, there could be many more demolitions and construction projects coming. The proposed infill project at Beach Towers (public hearing continues Feb 19, 2013), if approved, would be the next big one — and affect hundreds of renters currently living on the site, not to mention other neighbours for blocks away. People living in lower-density neighbourhoods may find it difficult to imagine the scale of impacts. Neighbours’ experience with St. John’s Church (1401 Comox, but address changed to 1061 Broughton) gave thousands of local residents a first-hand taste of a major demolition as Westbank chose to smash cement blocks on-site to save costs rather than truck them away for processing away from a residential area. Another current construction experience is with Maxines (now Alexandra, 21-storey tower by Millennium, jointly marketed with Concord Pacific) at Bidwell and Davie. (The same Henriquez Partners Architects was the proponent on both of the STIR developer incentive projects.) Noise, heavy truck traffic, dust and vibrations all take their toll on the local residents. The greater the population density in a community, the more people affected. The City of Vancouver recently revised the Vancouver Building Bylaw, with no public input to our knowledge, but were any improvements made to protect the rights and comfort of residents? Citizens should take note of the impacts of construction projects, report their concerns by calling City Hall at 311, and work to have the City make regulation changes to reduce the negative impacts on livability. We have learned that the Building Bylaw has many gaps. In contrast to other cities, for example, Vancouver has no standards to control or monitor ground vibrations. No requirement for reporting to the public about hazardous materials (asbestos, etc.) at a demolition site. No real-time monitoring of air quality around a site. And so on.